Will The Fed Kill Economic Growth? “When the market is going up, there is a tendency for investors to become more risk averse. Research shows that people tend to be risk-seeking when dealing with losses and risk averse when dealing with gains. As a result, with the market hitting all-time highs, individuals surprisingly are starting to become a little more nervous with regards to the future direction of the market. It is important to remember that market movements are time independent events. 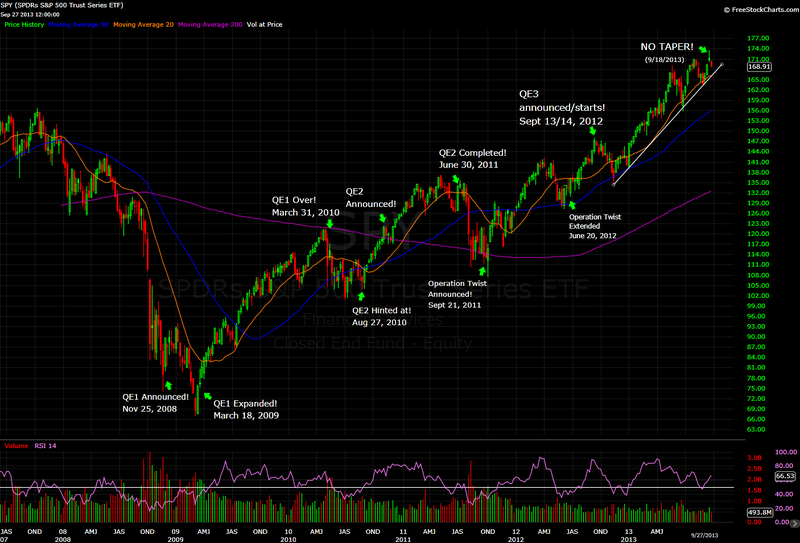 The fact the market is hitting new highs has no statistical bearing on what is going to happen next. The market is no more likely to go up or go down given it has appreciated in the past. If anything, there is some data that shows if a market is exhibiting long-term momentum that momentum tends to persist for a few months. The odds of investing in the equity market, over long periods of time, are in an investor’s favor. Forget the FED: Here’s The Troubling Trend That’s Really Behind Stock Market Volatility. 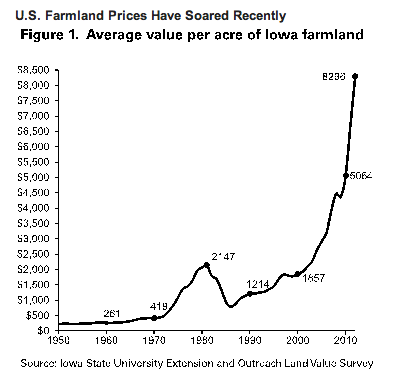 Is the farmland at risk? “Over the past several years, U.S. farmland prices have soared as grain prices rose and the Fed drove interest rates to historic lows. What happens now is that grain prices are falling as global output surges, yet U.S. farmers are suffering from a swing from a drought last year to too much rain this year, limiting their production as they lose global market share to foreign competition. Furthermore, the Fed is contemplating ending its bond-buying program later this year, which is already pushing up borrowing rates. These trends could lead to a reversal in land prices that could in turn be felt well beyond the farm. The U.S. Farm Credit System is a government-sponsored enterprise that provides federal guarantees for bad loans—much like Fannie Mae and Freddie Mac helped to fuel the U.S. housing boom. While a much smaller potential financial fiasco than the housing bust, financial companies with exposure may suffer. Also, investors around the world have poured billions into farmland as a “real asset” in recent years and may see losses”. 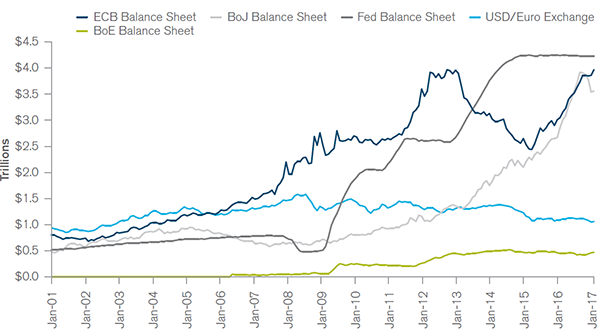 Is The Fed Going to Quit QE: What’s at risk? By Mitch Zacks, Senior Portfolio Manager at Zacks Investment Management, Inc.
“The market is always looking out six to eight months. For this reason, investing using macro-economic data is not necessarily a winning strategy. Macro-economic data tends to be backward looking. The unemployment numbers tell you what has happened in the past; however, they don’t give a good read as to what might happen in the future. The S&P 500 does not care what the GDP numbers were last quarter. Instead, it is looking at what GDP growth is going to be in the coming quarter and, most importantly, whether that growth will come in stronger or weaker than current expectations. For this reason, I almost always prefer to follow an investment strategy that focuses on forward looking metrics, like changes in analysts’ earnings estimates, rather than trying to decipher what the latest CPI number is telling us about the market.